When we think about Oncidium Alliance orchid, we often imagine something classic “Dancing Doll” looking – profound flat lip, resembling a skirt of a tiny doll, with usually little sepals and petals, which set off the brightness and beauty of the lip. 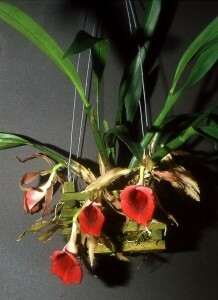 Trichopilia orchids are another story. Although these small to medium sized orchids belong to Oncidium Alliance, their flowers have quite an unusual structure (as for Oncidium relatives), resembling more classical-looking orchids with tubular lips such as Cattleya or Laelia. Trichopilia’s sepals and petals are often undulate or twisted, lips are three-lobed, with lateral lobes forming a tube. 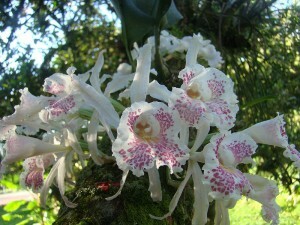 Trichopilia orchids are epiphytes and occasionally lithophytes (and rarely terrestrials) in tropical rainforests of Central and Southern Americas, particularly in Costa Rica, Colombia, Venezuela, Panama, Guatemala, Bolivia, Brazil, Peru, Ecuador, and Mexico. They prefer lower, large branches of trees as their biomes, that’s why they prefer more humidity and half-shade when growing indoors. They are sympodials, the rhizome is short, pseudobulbs are fleshy, round, oblong to cylindrical, bearing one leaf on the top of pseudobulb. Leaves are leathery. Flowers are born on newly formed pseudobulbs in short pendant, few-flowered inflorescences. The type species is Trichopilia tortilis. It has 6 inch wide flowers with green with brown sepals and petals and a white lip with yellow to a red throat, flowers are fragrant. Trichopilia suavis has exceptionally beautiful 4-inch wide fragrant, long-lasting flowers. Sepals, petals, and lip are white with pink spots, giving them a spectacular look. Trichopilia suavis blooms in late winter and early spring. Trichopilia marginata has nice 4 inch wide fragrant flowers, sepals and petals are yellow, while lip is white with a purple throat. There are also beautiful semialba clones, and tender Trichopilia marginata var. lepida, which have light pink sepals and petals and a pink lip. There are 45 currently recognized species in this genus. 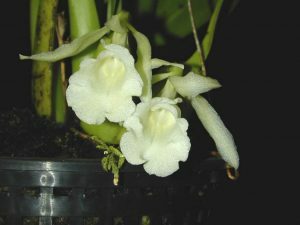 Trichopilia orchids are quite easy to grow. It is better to grow them in hanging baskets or pots (given the fact that they have pendant inflorescences), a potting mixture should be open with a good water capacity such as a mixture of seedling grade pine bark and some sphagnum. They prefer bright filtered light but tolerate semi-shade. Temperatures should be warm to cool, watering should be accurate when the plant in an active growth stage and quite moderate while it has some dormancy after flowering. They like some fertilizers when actively grow, but do not apply fertilizers on a dormant plant. They are also fond of humid air with strong air movement, mimicking the climate of their native biomes.